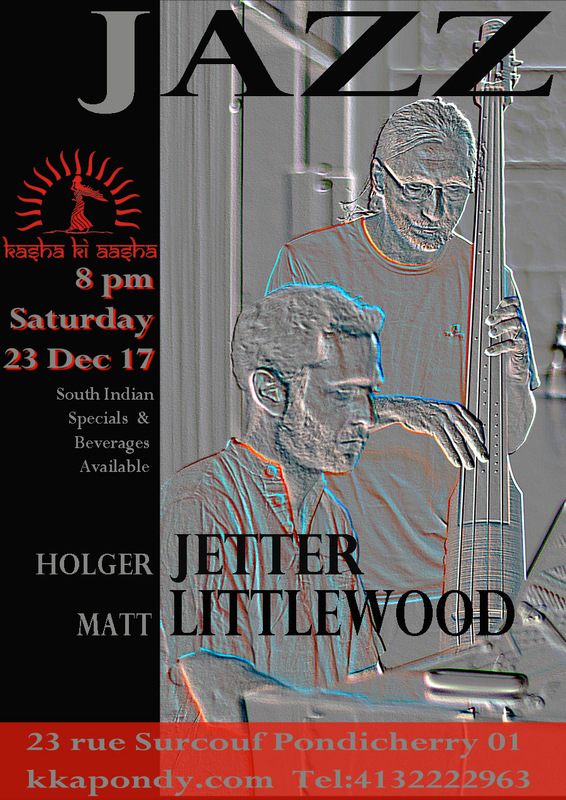 Holger Jetter and Matt Littlewood jazz up the start of the holiday season in Pondicherry this Saturday on Kasha Ki Aasha’s terrace. Join us for 2 sets of the classics with a bit of the contemporary thrown in performed by these two internationally acclaimed musicians on keyboard and strings. You definitely will be glad you joined us! 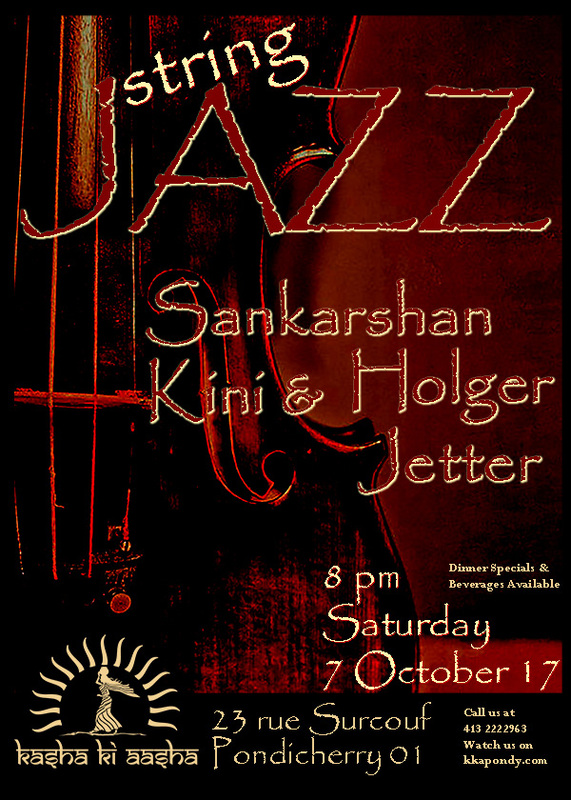 The jazz starts at 8 pm at Kasha Ki Aasha. We are just a hop, skip and a jump from the French Quarter at 23 rue Surcouf. We do take reservations until 8 pm at Tel: 413 222 2963. But then it is first come, first serve and space is limited. You wouldn’t want to miss any of the music anyway so come early! Dinner and Beverages are available. 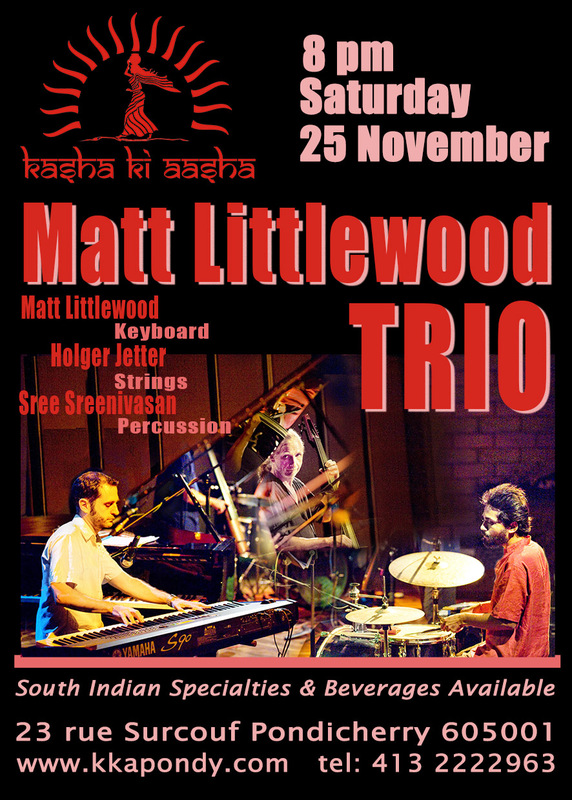 This Saturday evening, the Matt Littlewood Trio takes over Kasha Ki Aasha’s terrace for two sets of jazz classics. 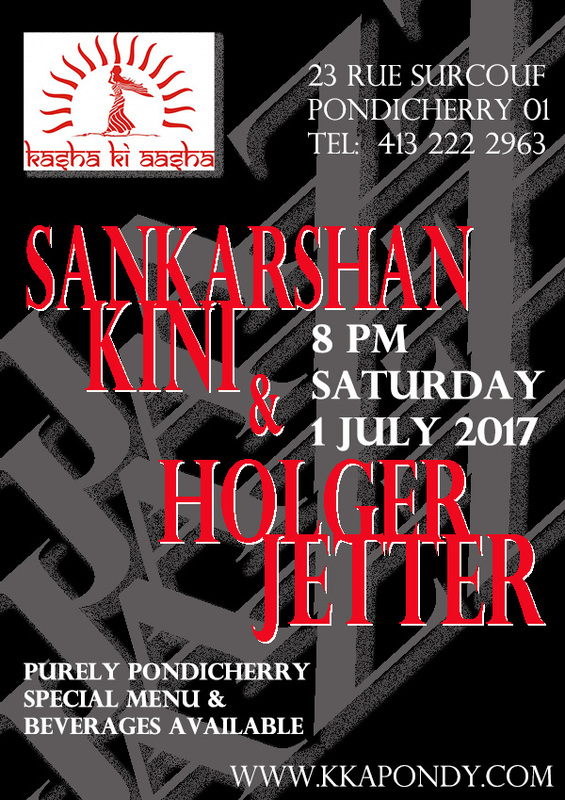 This the perfect start to Kasha Ki Aasha’s 3rd year of Purely Pondicherry Performances every single Saturday. Who can believe it? Time passes so fast when you have this series to look forward every weekend. Kasha Ki Aasha has been able to present our city with live music every weekend thanks to the many musicians who continue to support our effort to introduce a music scene here – helping us find new great talents, sharing the information about the venue with fellow musicians and sometimes even helping us by bringing their own sound systems until we finally get our own in 2018! Come join us. Performances at Kasha Ki Aasha are full of great music, great people and of course, great food. We are waiting for you! Performance begins at 8 pm. Want to hear a bit of what you are going to hear? Kasha Ki Aasha, 23 rue Surcouf, Pondy -01. Call us at 413.222.2963. 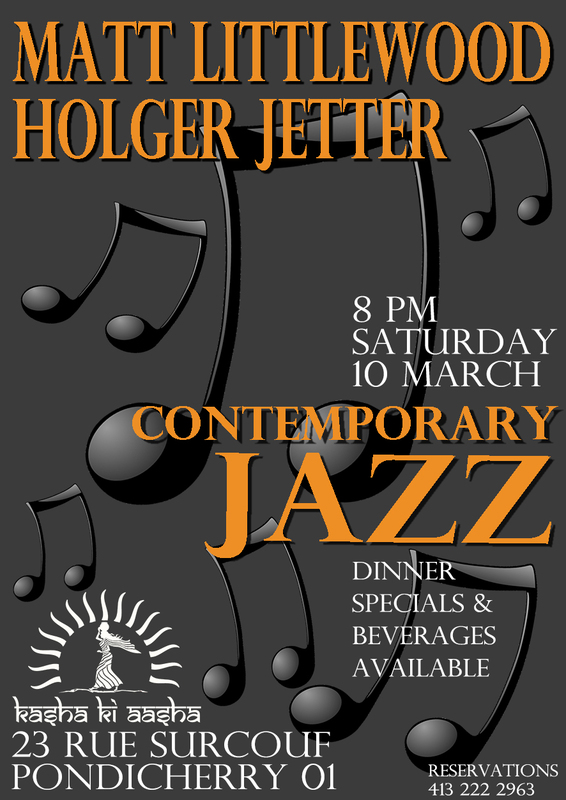 Saxaphonist Maarten Visser originally from the Netherlands joins German String Bass Artist Holger Jetter this Saturday at Kasha Ki Aasha for 2 sets of truly contemporary jazz. 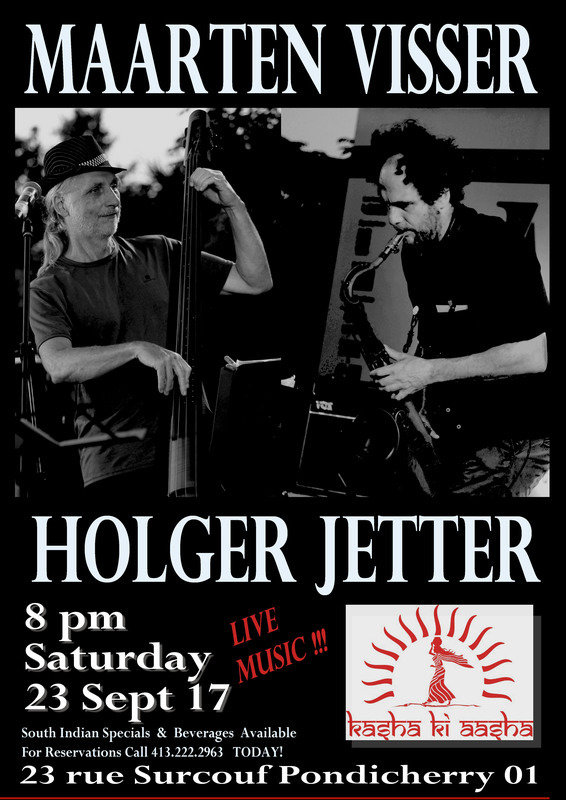 Starting at 8 pm, we look forward to a new musical experience with this duo on our breezy garden terrace. Come enjoy another Purely Pondicherry Performance! Dinner and drinks are always available. Call 413 222 2963 to reserve a table! Between 1994 and 1998 Maarten Visser studied saxophone at the ‘Brabants Conservatorium (Netherlands). After finishing conservatory in 1998 he studied carnatic music in Chennai. In 2000 he started collaborating with choreographer, Padmini Chettur composing music for ‘Segment of a Solo’ (2000), ‘Fragility’ (2001), ‘3 Solos’ (2003), ‘Paperdoll’ (2005)’, PUSHED (2006), Beautiful Thing 1 (2009), and Beautiful Thing 2 (2011). These contemporary dance-productions go on to travel internationally. In 2006 Maarten visser conducts a workshop called; Sound and Silence (Geluid en Stilte) a workshop to create a microtonal piece for 6-14 musicians. The workshop is produced by ‘ei- producties’ an organization started in 2005 by Ferdi Schukking and Maarten Visser. ‘ei-producties’ organizes weekly concerts of experimental music going on to produce a number of albums. From 2006 onwards Maarten Visser has been based mostly in Chenna recording and performing. A musician, composer, arranger and producer, Holger studied western classical music concentrating on the violin at the Richard Strauss Conservatory in Munich and the Mozarteum University of Salzburg with Prof. Jurgen Geise with further studies with Lynn Blakeslee and Jean-Jacques Kantoroff . At the age of 18, he released his first recording with the German rock band, Gantebein. His broad stylistic and artistic interest subsequently moved him from the bluegrass band Flying Spoon Acoustic Band via the Argentinean tango ensemble Quartetto Tango and klezmer music at the Theater der Jugend to he Clowns duo, Conelli. Hoger’s strong affinity to improvised music led to the formation of the Modern String Quartet where fresh sounding string arrangements and many original compositions contributed to the wide success of the ensemble. In the following six years of collaboration involving more than 1000 concerts and 2 CD productions, the quartet toured with well known artists such as Constantin Wecker, Joan Baez and Mercedes Sosa. During this period Holger intensified his activities as composer producing music for audio books and films. AFter the first American tour he left the Modern string quartet for Kolkatta to study with Ustad Imrat Khan. Now settled in Auroville, he composes for dance productions, initiated a children’s choir and composed and produced the children’s opera Beyond Asleep and Awake. Together with his partner, Tina Suchanek, he built the Sunshine Music Studio. Ongoing performances and collaborations with international artists as well as work with his trio, Three Raags continue in India and abroad. Kasha Ki Aasha welcomes British saxaphonist and pianist, Matt Littlewood and German string musician, Holger Jetter to our terrace this Saturday evening in the next of the Purely Pondicherry Performances. 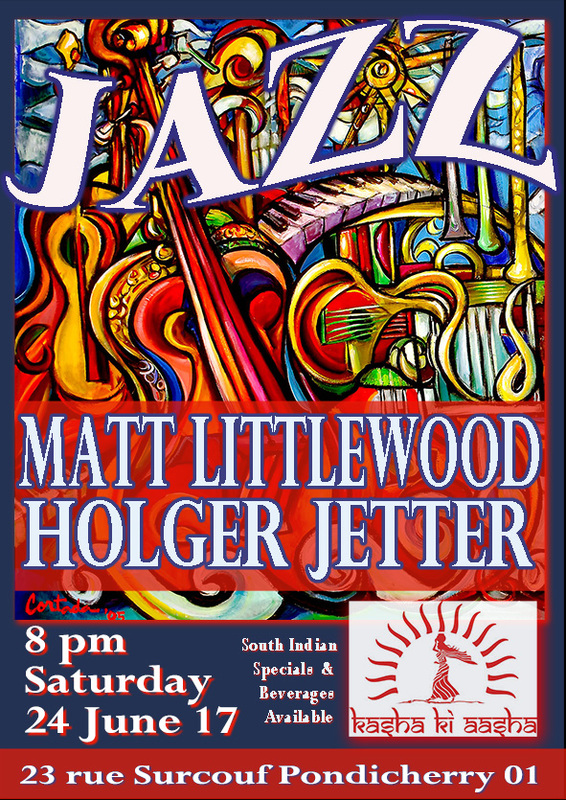 Matt Littlewood, currently based in Auroville, is a jazz saxophonist, pianist, composer and music teacher. After his studies at Exeter University in the UK, he is now an active member of the Indian Jazz and World Music scene. Holger Jetter, classically trained in violin and guitar (Mozarteum Salzburg, Austria). As co-founder of the “Modern String Quartet” he has performed over 1000 concerts in 6 years while at the same time performing with renowned musicians, such as Mercedes Sosa, Joan Baez, Charlie Mariano and Konstantin Wecker. Since more than 25 years he works as musician, composer, arranger, producer and music educator in Auroville. During the past fifteen years he has mainly focused on contemporary improvised music and has been touring in India, Europe and the United States. Holger has been teaching a large variety of skills to young enthusiastic music students. At present he is setting up a Music Academy for higher musical studies in Auroville, which aims at opening its gates to dedicated student in 2018. 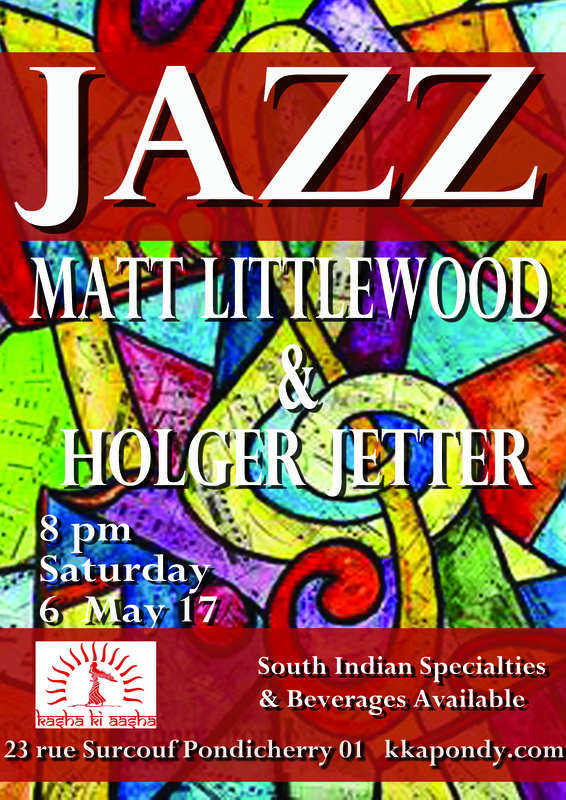 We look forward to another great evening of music on our terrace this Saturday, 6 May starting at 8 pm. Our kitchen’s great South Indian specialties are always available to go along with cool and refreshing beverages. Kasha Ki Aasha is at 23 rue Surcouf, Pondicherry 01. Our number is 413 222 2963 if you need directions, but sorry NO RESERVATIONS!